Inspired by Ethiopian Afro-mystical grooves and melodies of Mulatu Astatke. Wellington's finest playing some of the golden tunes of the great Ethiopiques era. 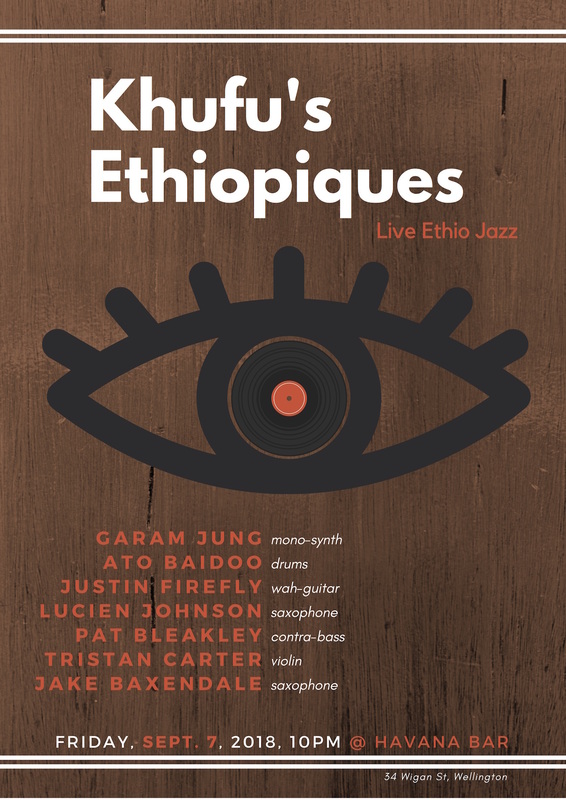 Featuring Ato Baidoo (Ghana) on drumkit and percussion, Justin Firefly Clarke: wah guitar, Garam Jung, Lucien Johnson and Jake Baxendale on saxophones and keyboards, and Patrick Bleakley on bass. "Upon hallucination, the Khufu ship sails again. Once sealed at the foot of the Great Pyramid of Giza (around 2500 BC) a vision appears on the horizon, a boat laden with treasures, and of silken sound tapestries woven of etheric threads."